We are pleased to offer free WiFi in the shop. In our Community Cafe we also have powerpoints and USB ports for charging phones and laptops. * Look out for their regular offers of 3 items cleaned for a bargain price! 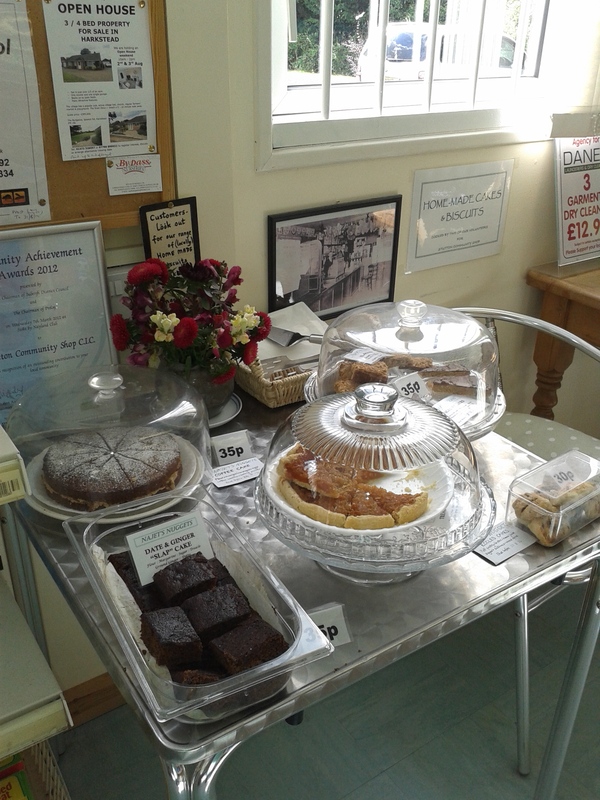 We are very fortunate that two of our Stutton residents supply the shop with slices of home-made cakes to have with your tea or coffee, either in the shop or to take home.A choice of delicious chocolate brownies, fruit loaf, sponge cakes and home-made biscuits are usually on offer at very reasonable prices. In addition, we now have cakes made by a professional cake-maker who lives round the corner (very conveniently for us). Rosemary brings her delicious cakes in on a Friday morning. They vary each week but here’s some examples. Margaret’s scones come in on Tuesdays – plain and cheese. 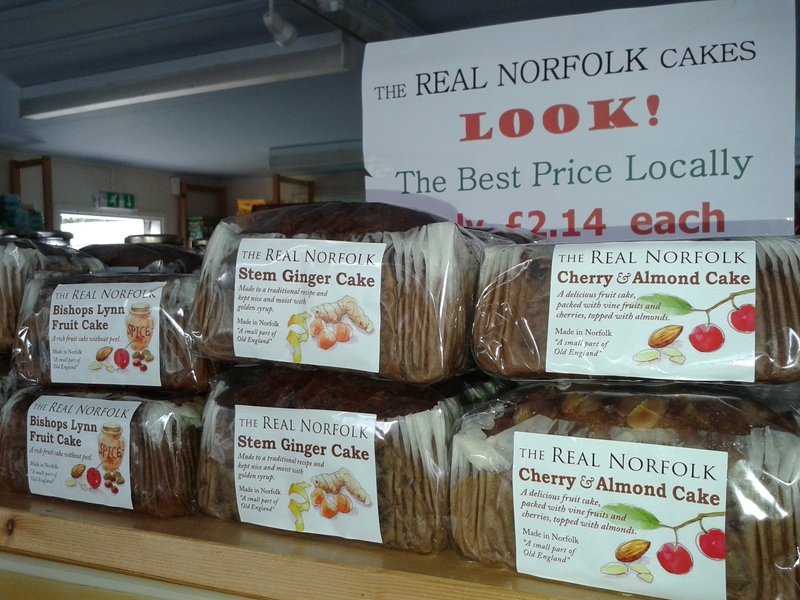 Although not strictly “home-made”, we also stock a range of The Real Norfolk Cake Company cakes which are again reasonably priced and taste very good. The Real Norfolk Cake Company use where possible, old English recipes to recreate the original cake, all made with Munns locally produced rapeseed oil. Orange and Bishop’s Lynn Fruit Cake “loaves”. Teas, coffees and hot chocolates are available throughout the day in our lovely new Community Cafe. Take-away cups are available if you are in a hurry. Our freshly made coffee, tea or hot chocolate, perhaps with a slice of delicious home-made cake, or a sandwich, all at competitive prices, make the Cafe a good place to start or end your walk in the area. We can also offer a range of ice-creams or drinks from the chiller to cool you down on warmer days. In an area of limited mobile phone signals, there is free WiFi access in the shop for your laptop or phone. Over the counter medicines, including some for children, are available for coughs, colds and everyday ailments. Royal Mail stamps (1st and 2nd class) are available although we do not have any Post Office services or facilities. We can accept parcel deliveries with prior notice and keep them for you to collect when convenient. We have two noticeboards, one for posters of local events which are displayed without charge and one for local businesses and items for sale, the charge for which is just £1 per calendar month. We sell tickets for both the regular Stutton Cinema as well as the Tattingstone Cinema Nights along with tickets for occasional local events. We stock the two local O.S. maps for our area plus a new pocket-sized large-scale walking map of the immediate vicinity at a value price of £3.50 which includes a useful scale to judge how long the walks will take, based upon your walking speed. Local bus timetables and copies of Roundabout (our village newsletter and Parish magazine) are normally available in the Shop and we also have copies of the Local History Journals (including some back-copies) for sale at £3.50 each. 9 – – 11 on Sundays. On Bank Holidays we are normally open 9 – 12.30 pm.